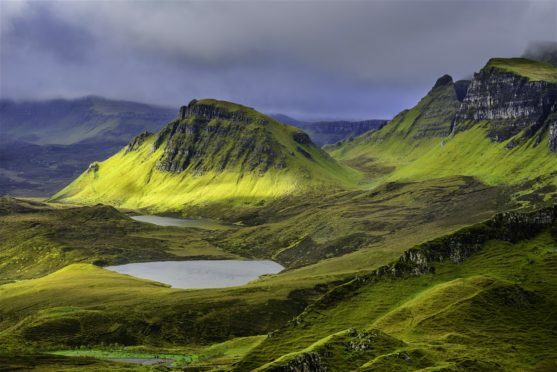 Scientists have made an explosive discovery about a volcanic eruption on Skye which is likely to have caused major changes in the world’s climate. Researchers from Scotland, Sweden and England have linked the explosion, which took place 56 million years ago, to a prehistoric spike in global warming. Rob Ellam Professor of Isotope Geochemistry at Glasgow University, based at the Scottish Environmental Research Centre said: “We are saying that the eruption we have identified is rather bigger than anyone has ever imagined before. “We have known there were volcanoes in the Hebrides and in Skye for a long time. Writing in the journal Scientific Reports, the researchers present evidence of an explosion in the same league as the eruption of Krakatau in 1883. It was one of the biggest volcanic catastrophes in recorded history in which the shock waves travelled round the world three and a half times. They found their evidence in pitchstones, which are created when volcanic lava or magma cools quickly. It creates a glassy rock. Much later, it was prized by Stone Age humans. The researchers found pitchstone outcrops from a single, huge eruption 18 miles apart on Sgùrr of Eigg and the Skerry of Òigh-sgeir (Hyskeir) in the Inner Hebrides.